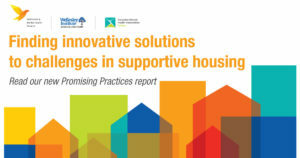 A new report illustrates how supportive housing providers across Ontario have come together to address unique and complex local challenges to help individuals in need. Promising Practices: 12 Case Studies in Supportive Housing for People with Mental Health and Addictions Issues is a new resource guide produced by Addictions and Mental Health Ontario (AMHO), Canadian Mental Health Association (CMHA), Ontario, and the Wellesley Institute. The guide shares examples of how supportive housing providers throughout the province have implemented innovative solutions and partnerships to help overcome local challenges. Read the complete resource guide at the AMHO website: www.amho.ca/promisingpractices.